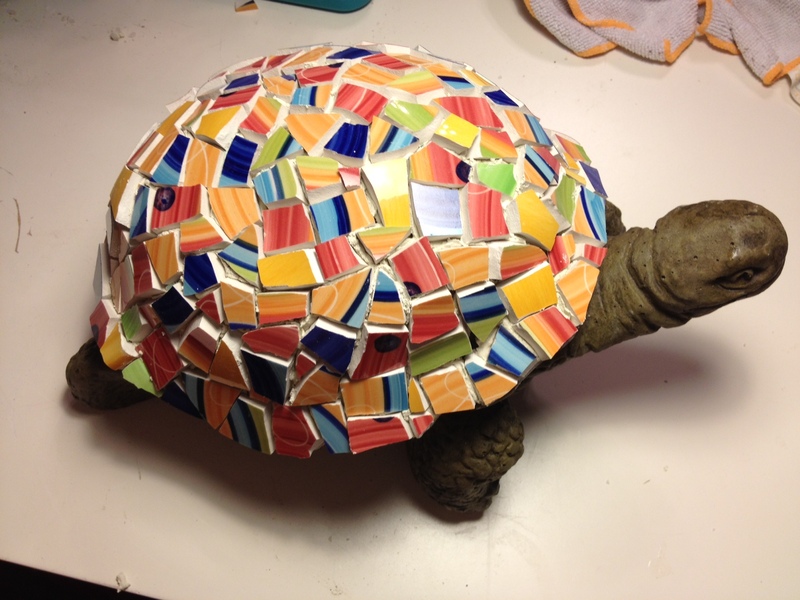 Mosaics, Drawing and Catch-Up Oh My! Has it really be nearly two months since I last posted here? Sheesh. Time sure flies. It’s been a busy summer–at work, at home, and in my studio. The good news is my silence does not mean that I haven’t been working on mosaics…just means I’ve been a bit lax on posting! So, here’s my catch up post! 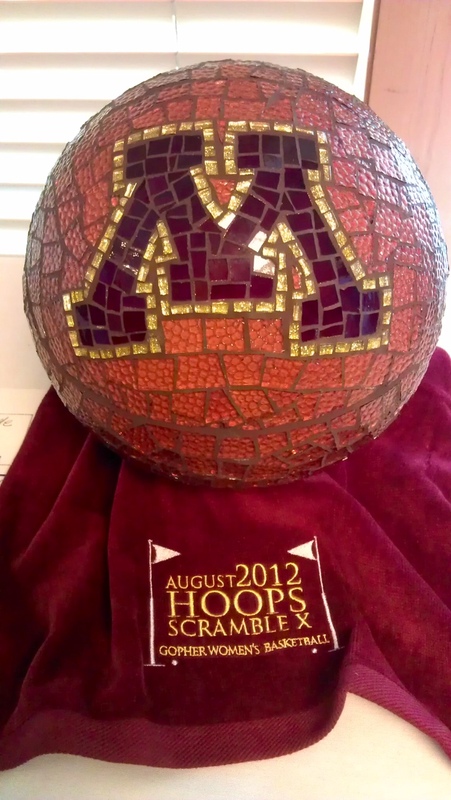 First things first–a picture of the finished Minnesota Women’s Gophers Basketball Gazing ball as it looked at the silent auction at the Hoops Scramble in August. I absolutely love how it turned out and so do its new owners! 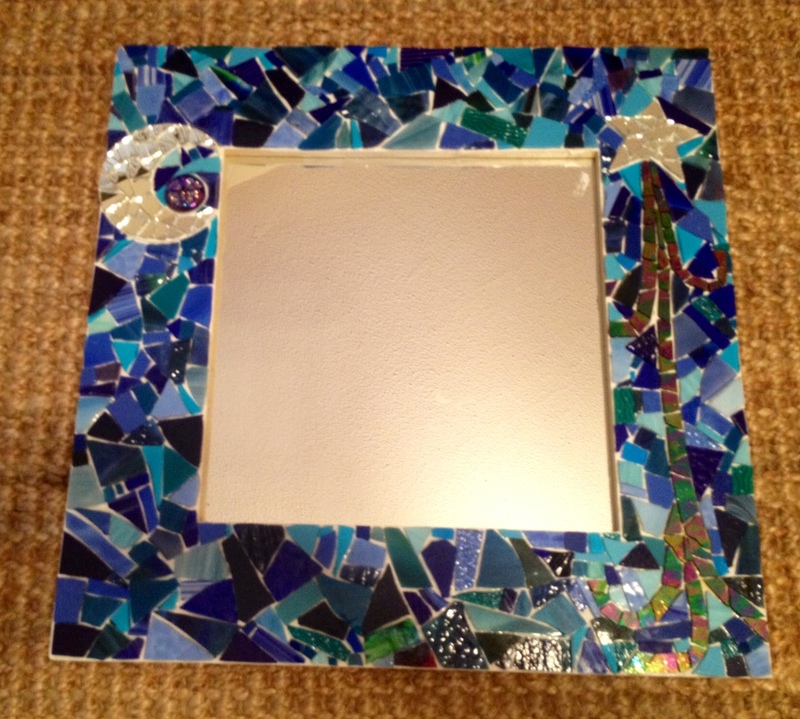 Next, I started and finished a new mirror that I call “Man in the Moon.” I plan to grout it in the next week or so and look forward to posting it here soon! I call it man in the moon because of the little dark moon face that is sitting in the crook of the crescent moon. The man in the moon is always there, even when we can’t see him. BTW, have you seen the Pixar short called “La Luna?” It’s the opening short before Brave. I saw it and simply fell in love with it. I’m guessing there will be more moons in my work soon! Here’s a preview of “La Lunna” if you want to take a peek. You probably noticed that there is the word “drawing” in the title of today’s post, which is out of the ordinary for me. I have recently started to work on learning to draw/sketch people so that I can add them to my mosaic works. Without the ability to draw what I see in my mind’s eye, I’m left trying to cobble my mosaic line work together from other people’s drawings. 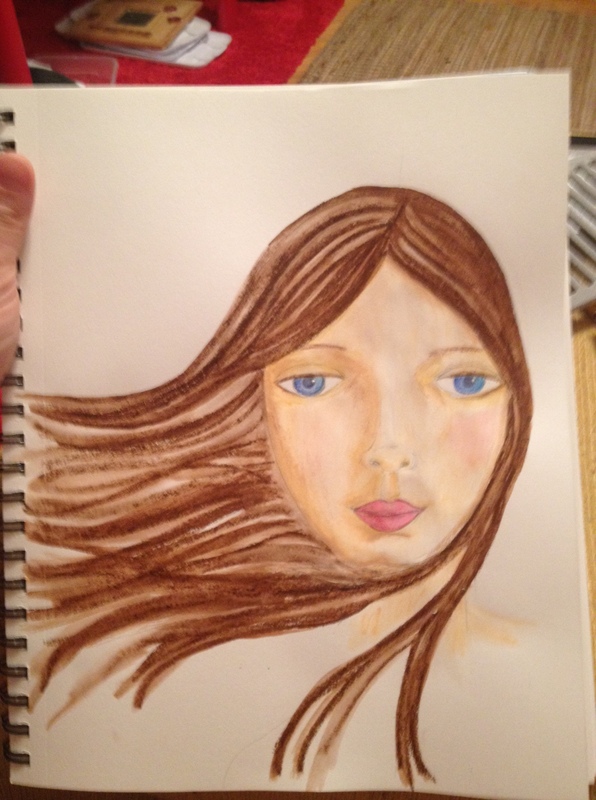 Instead, I’m teaching myself to draw a bit through the tutorials and such on a site called Willowing & Friends (http://willowing.ning.com/). It’s a great site run by a woman in the UK named Tam…and I drew the following face after viewing one of her free online tutorials. Please keep in mind that I can barely draw stick figures on most days, so this is a huge leap for me, which I attribute to Tam’s easy going teaching skills. I’m thinking of signing up for Tam’s online “Life Book” class and am definitely thinking about ways to translate the faces I draw into mosaic art too! Fun stuff to learn and I’m super excited about it! AND, the Twin Cities Women’s Choir is back in session and we are already three rehearsals into our new season! Look for more information on our December concert called Illuminations soon! This entry was posted in Finished Work, Mosaic Musings, Work in Progress and tagged drawing, learn to draw, mosaic, willowing & friends, women's basketball. Bookmark the permalink.